The palette of unusual, perfectly composed, nature-inspired colours in which late summer meets with early autumn. With Warm Memories, putting on make-up becomes a unique moment that stays in your memory for longer. 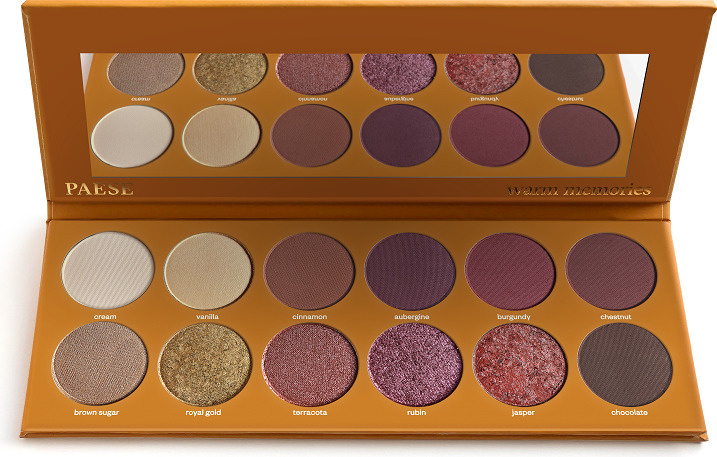 The palette includes 12 warmth-filled shadows, with foil, matte and satin textures. The lighter colours will brighten your look and delicately accentuate your natural beauty, whereas the darker ones will draw attention to your visionary personality, and perfectly fit your evening outfit. 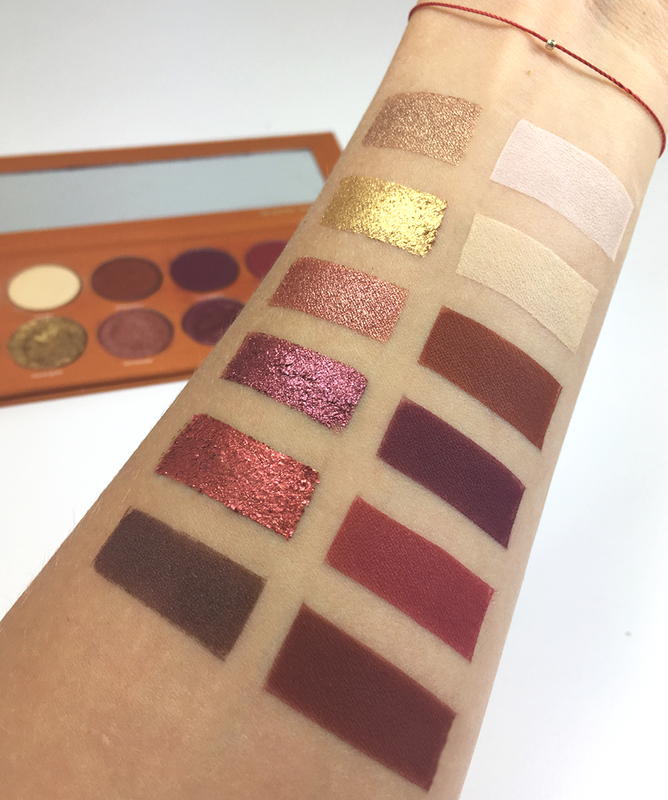 Warm Memories is also care for your skin, as well as innovative ingredients which guarantee the quality, durability, and pigmentation of eyeshadows. You should cherish important things which you would like to keep longer. 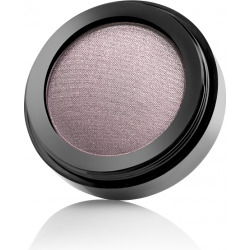 Therefore, every eyeshadow contains Cerafluid* which moisturizes your skin and helps to maintain its young look. Remember, you are naturally beautiful! INGREDIENSER / MATERIALE : ROYAL GOLD INCI: Mica, Octyldodecyl Stearoyl Stearate, Dimethicone, CI 77891, Zinc Myristate, CI 77491, Caprylyl Methicone, Diisostearyl Malate, Isononyl Isononanoate, Pentaerythrityl Tetraisostearate, Trimethylsiloxysilicate, Synthetic Fluorphlogopite, PPG-3 Hydrogenated Castor Oil, Olive Glycerides, Phenoxyethanol, CI 77510, Ceramide NP, Ethylhexylglycerin. RUBIN INCI: Mica, CI 77491, Octyldodecyl Stearoyl Stearate, Dimethicone, Zinc Myristate, Diisostearyl Malate, Pentaerythrityl Tetraisostearate, Isononyl Isononanoate, Caprylyl Methicone, Synthetic Fluorphlogopite, Trimethylsiloxysilicate, PPG-3 Hydrogenated Castor Oil, Olive Glycerides, Phenoxyethanol, Ceramide NP, Ethylhexylglycerin. JASPER INCI: Synthetic Fluorphlogopite, Mica, Octyldodecyl Stearoyl Stearate, CI 77491, Zinc Myristate, Dimethicone, Pentaerythrityl Tetraisostearate, Isononyl Isononanoate, Diisostearyl Malate, Caprylyl Methicone, Trimethylsiloxysilicate, PPG-3 Hydrogenated Castor Oil, Olive Glycerides, Phenoxyethanol, Ceramide NP, Ethylhexylglycerin.CHOCOLATE, VANILLA, CINNAMON INCI: Talc, Boron Nitride, Silica, Aluminum Starch Octenylsuccinate, Mica, Octyldodecyl Stearoyl Stearate, Polymethylsilsesquioxane/Silica Crosspolymer, Zinc Myristate, Caprylyl Methicone, Olive Glycerides, Phenoxyethanol, Methicone, Ceramide NP, Lauroyl Lysine, Isopropyl Titanium Triisostearate, Bis-PEG-15 Dimethicone/IPDI Copolymer, Allantoin, PEG-8, Ethylhexylglycerin, Tocopherol, PEG-2 Soyamine, Ascorbyl Palmitate, Ascorbic Acid, Citric Acid, [+/-: CI 77891, CI 77491, CI 77492, CI 77499]. CREAM INCI: Talc, Boron Nitride, Silica, Aluminum Starch Octenylsuccinate, Zinc Myristate, Mica, Octyldodecyl Stearoyl Stearate, Polymethylsilsesquioxane/Silica Crosspolymer, Caprylyl Methicone, Olive Glycerides, Isopropyl Titanium Triisostearate, Bis-PEG-15 Dimethicone/IPDI Copolymer, Phenoxyethanol, Methicone, Ceramide NP, Lauroyl Lysine, Allantoin, PEG-2 Soyamine, PEG-8, Ethylhexylglycerin, Tocopherol, Ascorbyl Palmitate, Ascorbic Acid, Citric Acid, [+/-: CI 77891, CI 77499, CI 77492, CI 77491]. TERRACOTTA INCI: Mica, Octyldodecyl Stearoyl Stearate, Talc, Aluminum Starch Octenylsuccinate, Boron Nitride, Caprylyl Methicone, Olive Glycerides, Zinc Myristate, Phenoxyethanol, Ceramide NP, Allantoin, PEG-8, Lauroyl Lysine, Ethylhexylglycerin, Isopropyl Titanium Triisostearate, Bis-PEG-15 Dimethicone/IPDI Copolymer, Tocopherol, Ascorbyl Palmitate, PEG-2 Soyamine, Ascorbic Acid, Citric Acid, [+/-: CI 77491, CI 77891, CI 77492].CHESTNUT INCI: Talc, Silica, Boron Nitride, Aluminum Starch Octenylsuccinate, Mica, Octyldodecyl Stearoyl Stearate, Polymethylsilsesquioxane/Silica Crosspolymer, Aluminum Hydroxide, Zinc Myristate, Caprylyl Methicone, Olive Glycerides, Phenoxyethanol, Isopropyl Titanium Triisostearate, Bis-PEG-15 Dimethicone/IPDI Copolymer, Methicone, Ceramide NP, Lauroyl Lysine, Allantoin, PEG-8, PEG-2 Soyamine, Ethylhexylglycerin, Tocopherol, Ascorbyl Palmitate, Ascorbic Acid, Citric Acid , [+/-: CI 77491, CI 77499, CI 15850, CI 77891]. BURGUNDY, OBERGINE INCI: Talc, Silica, Boron Nitride, Octyldodecyl Stearoyl Stearate, Aluminum Starch Octenylsuccinate, Mica, Aluminum Hydroxide, Polymethylsilsesquioxane/Silica Crosspolymer, Zinc Myristate, Caprylyl Methicone, Olive Glycerides, Phenoxyethanol, Isopropyl Titanium Triisostearate, Bis-PEG-15 Dimethicone/IPDI Copolymer, Methicone, Ceramide NP, Lauroyl Lysine, Allantoin, PEG-8, Ethylhexylglycerin, Tocopherol, PEG-2 Soyamine, Ascorbyl Palmitate, Ascorbic Acid, Citric Acid, [+/-: CI 77499, CI 15850, CI 77491, CI 77007, CI 77891]. BROWN SUGAR INCI: Mica, Talc, Octyldodecyl Stearoyl Stearate, Boron Nitride, Silica, Synthetic Fluorplogopite, Aluminum Starch Octenylsuccinate, Polymethylsilsesquioxane/Silica Crosspolymer, Zinc Myristate, Olive Glycerides, Caprylyl Methicone, Phenoxyethanol, Ceramide NP, Methicone, Lauroyl Lysine, Isopropyl Titanium Triisostearate, Bis-PEG-15 Dimethicone/IPDI Copolymer, Allantoin, Ethylhexylglycerin, PEG-8, Tin Oxide, Tocopherol, PEG-2 Soyamine, Ascorbyl Palmitate, Ascorbic Acid, Citric Acid, [+/-: CI 77491, CI 77499, CI 77891, CI 77492]. Cerafluid is a liquid ceramide III (a type of lipid of the horned layer of epidermis, the amount of which decreases with age) combined with olive glycerides. It acts as the main active ingredient in our eyeshadow formula. It shows the highest compatibility with skin components, thanks to its natural base. Its effect is compared to the one of cement. It links/binds skin cells, improves its smoothness, elasticity, and hydration. Cerafluid also restores and strengthens the protective barrier of skin. In addition, it reduces wrinkles, decreases the loss of water from the deeper skin layers, and retains moisture in skin by strengthening the stratum corneum of epidermis. Such effects are confirmed by in vivo tests with 1-2% of the ingredient in the recipe carried out 60 minutes after its application, as well as after 30-day period of applying the cosmetic with this ingredient. Pigments with hybrid coating are innovative pigments, in which the hybrid coating is responsible for adhesion to skin, ensuring pleasant spreading of shadows on the eyelid. Thanks to this unique coating, more pigments can be added to the product formula. This results in the eyeshadows being highly pigmented, having strong opacity and distinctive colours. Additionally, it allows eyeshadows last longer. Granpowder QSC is an innovative microsphere powder (silicone resin combined with silica) containing properties that absorb both water and oil. It creates smooth and touch-friendly texture of the powder.